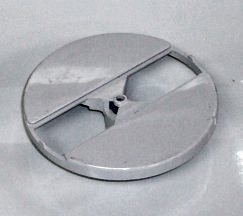 Krups MS-4817989 (also MS-5842484) plastic blade holder disc for Regal La Machine food processor models including those made by Moulinex and Krups brands. This is the disc which mounts carries the metal shredding and slicing blade inserts - it works with the food proccessor models listed below. Restore your La Machine to top performance and production with this original equipment part.